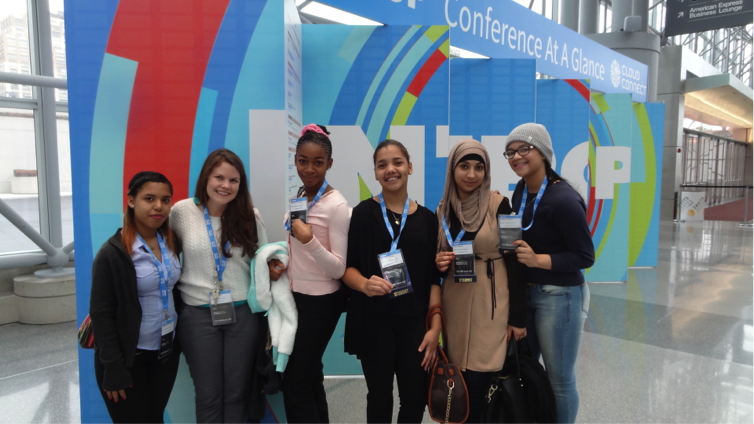 New York City Public High School students attending the Women in Technology Panel at the Interop Conference, the leading independent technology conference and expo, via The Community Corps. Mentoring—especially STEM/Tech mentoring—is at the core of what we do. We have connected with tech volunteers who are living, breathing, tangible examples of success in the industry. We want to inspire everyone, but especially underserved youth, women and veterans, to pursue education and careers in STEM/Tech. And we are committed to supporting the teachers and other education partners who are designing and delivering STEM/tech curriculum. We provide our partners the tech volunteers they need to deliver the strongest impact. For National Mentoring Month, The Community Corps is joining forces with our nonprofit and school partners to bring a multitude of STEM mentoring volunteer opportunities onto our platform. The Community Corps volunteers have regularly voiced a preference for STEM education opportunities. In January, we will be sharing these opportunities with our skilled tech volunteer network in our corporate partners and our professional association partners. Our goal is to have a wide regional spread across North America, with a focus on New York City, Chicago, North Texas, San Francisco Bay Area and Toronto. In 2014, The Community Corps and our Tech volunteers gave over 20,000 hours in support of closing the Tech Skills gap – for Women, Nonprofits, Schools, Individuals and Veterans. Over 65% of all of our volunteering efforts are targeted at STEM education. In 2014, The Community Corps Volunteers donated over 7,000 hours to directly support the advancement of Women and Girls in STEM and Tech fields. In 2015, our focus on Women and Girls in STEM / Tech will continue. We will continue our support to NCWIT Aspirations in Computing, Iridescent and Technovation Challenge. We will expand our work with the New York City Department of Education and schools across the nation to provide inspiring speakers to young women so that they can achieve their potential and use technology to change their world. NPower mobilizes the tech community and provides individuals, nonprofits, and schools opportunities to build tech skills and achieve their potential. The Community Corps, NPower’s skills-based volunteering program, connects technology professionals with high impact nonprofits and innovative education partners. Our tech volunteers enable schools and nonprofits across the country to use technology more effectively and inspire the next generation to pursue careers in science, technology, engineering and math (STEM). For more information on NPower, please go to npower.org or follow us on Facebook, LinkedIn, Twitter, or YouTube.